Been interesting to note that when it comes to trans issues lately, it seems Latin American nations are leading the way when it comes to positive forward momentum on human rights issues that affect trans people. Brazil’s universal health care system not only provides free SRS, they created a national LGBT council that formulates policy recommendations and guidelines aimed at decreasing the discrimination that TBLG people face in the country. Brazilian transwomen from Roberta Close to Lea T are breaking ground in many fields inside and outside the country. Colombia not only has transwoman Endry Cardeno acting in major soaps, she has a spread in a major men’s magazine. Shelcy Sanchez recently made a historic run for a seat in the Colombian congress. Colombian transwomen since 1993 have been able to easily change their names on the national ID card, but the gender marker field requires SRS. The Costa Rican Supreme Electoral Court after agitation from transwoman Audrey Porras Araya, published a resolution allowing transsexuals to appear on their national ID with the image they frequently present to society. 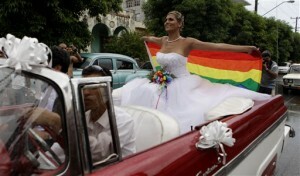 Uruguay passed legal protections in 2004 and in 2009 approved a gender change law. Their neighbors in Argentina are currently debating a law that will make it easier for trans people to change documentation as well. In Mexico City, transpeople living in the DF have been able to change their names and gender markers since 2008. One transgender couple got married. Efforts are underway to try to expand those policies to areas outside the Federal District despite resistance from the Roman Catholic Church..
Cuba has made progress on these issues as well. It provides free SRS through CENESEX and has made it easier for transpeople to change documentation. And as Wendy Iriepa demonstrated a few days ago, transpeople can get married there. So while there has been major progress in Latin America as documented on the electronic pages of Blabbeando , xQsi Magazine and other blogs dedicated to tracking TBLG events in the Latin@ community and the region, there are still problems in terms of the influence of the Roman Catholic Church and its anti-trans doctrine that is fueling a spike in anti trans violence across the region. Honduras has long been a trouble spot for anti trans violence. As much progress as Brazil has made on other fronts, they still reported over 250 murders involving TBLG people. There has been a spike in anti-trans violence aimed at transpeople in Puerto Rico, Peru and in Mexico. But despite the problems, when you look at the trans civil rights balance sheet for Latin America, it’s definitely trending toward the positive side of the ledger.